Illustration of C.J. Thomsen from 1902. Christian Jürgensen Thomsen (December 29, 1788 – May 21, 1865) was a Danish archaeologist and museum curator. He pioneered the ethnographic museum, and his work contributed to popular interest in museum exhibits. His most significant contribution came as a result of his work at the National Museum of Denmark, where he recognized the need for a clear standard to organize the large collections of artifacts. He proposed chronological classification of prehistoric artifacts, with the innovative assumption of a progression in technology rather than concurrent development. Based on the nature of the tools discovered, namely stone, bronze, and iron, he proposed a tripartite classification system of development from what he called the Stone Age to the Bronze Age, and then to the Iron ages. This system was adopted by numerous museums. His successor, Jens Jacob Asmussen Worsaae, was able to provide scientific evidence in support of his chronology. Although Thomsen's system was later modified, and subdivisions added, his system was foundational to the understanding of prehistory, and served as the basis for further development by succeeding generations of archaeologists. He recognized that human society developed over long periods of time, and that such historical development can be traced by the scientific study of its remains for periods prior to the time of written records. This approach is essential to supporting a scientific account of human prehistory, which had previously belonged in the realm of religion and mythology. Christian Jürgensen Thomsen was born on December 29, 1788 in Copenhagen, Denmark, the son of a wealthy merchant. He initially started to work with his father, gradually developing his interest for archaeology and antiquities. Although he lacked academic training, in 1816 he succeeded Rasmus Nyerup as Secretary of the Danish Royal Committee, being appointed the head of its "antiquarian" collection. That collection eventually developed into the National Museum of Denmark in Copenhagen, and Thomsen became the first curator of the museum in 1819. Thomsen had a business spirit and knew how to attract the general public. He used lively guided tours which presented certain parts of exhibitions with such imagination that people could vividly experience the past. This resulted in people starting to flock into museums. The first half of the nineteenth century is known today as the Golden Age of Danish museology, the period when many museum collections in Copenhagen were reorganized based on Thomsen’s classification system. In 1841, Thomsen established the first ethnographic museum in Copenhagen. By the 1850s, most of Thomsen's collections were moved to Prinsens Palæ, the Crown Prince's Palace, an eighteenth–century rococo palace in the center of Copenhagen, which in 1892 was reorganized into the present National Museum. His collection was magnificent, containing an ethnographic collection, a coin collection, and prehistoric and historical collections. The museum eventually became famous not only in Copenhagen and Denmark, but all around Europe. Thomsen died on May 21, 1865, in Copenhagen. Thomsen remains famous for his Three Age System, the chronological classification of prehistoric artifacts. As the European museums became overrun with archeological material, they needed a method of dating the artifacts. Thomsen rejected random arrangements, in which museums used their own classification systems in arranging the displays. Thomsen believed that a better system could be devised, which would take into account the chronological sequence of when artifacts were made. He suggested that the early hominids of Europe had gone through stages of technological development, which were reflected in the production of tools made of stone, bronze, and iron. Thomsen argued that nobody would use stone tools after bronze tools were constructed, and that nobody would use bronze ones if iron tools were available. Following that logic, he hypothesized that human technological development proceeded in stages, from more primitive to more advanced. Thomsen first explained his tripartite system—Stone Age, Bronze Age and Iron Age—in his work Ledetraad til nordisk Oldkyndighed (Guidelines on Nordic Antiquarianism) in 1836. Prior to Thomsen, Greek poet Hesiod suggested four stages of human history—Age of the Gods (Golden Age), Age of the Demi-Gods (Silver Age), Age of the Hero (Bronze Age), and Age of Man (Iron Age). However, in contrast to Hesiod, whose ages declined in quality as humankind becomes more cruel and corrupt, Thomsen saw humans progressing to higher levels of technological development. Others had suggested stages more similar to Thomsen's: In the eighteenth century, French archaeologist Nicholas Mahudel had also proposed the categorization of prehistoric times into ages of stone, bronze, and iron. In 1813, historian Videl-Simonson had suggested that earliest antiquities of Scandinavia were of wood and stone; and that only later appeared copper or iron tools. Thomsen also wrote one of the first systematic treatises on gold bracteates—thin, single-sided gold coins produced in Northern Europe in the Migration period. He divided the typology for bracteates into several letter-named categories, a system introduced in an 1855 treatise named Om Guldbracteatene og Bracteaternes tidligeste Brug som Mynt. Thomson's successor to the directorship of the National Museum of Denmark, Jens Jacob Asmussen Worsaae, found evidence to support Thomson’s ideas. He tested the stratigraphic soundness of the system, finding it valid—the layers of Stone Age tools underlaid those with bronze or iron. Worsaae published his results in 1843. It was the first time that scientific evidence existed to support the thesis of three prehistoric ages. Thomsen's Three Age System was later modified into four ages, subdividing the Stone Age into the Old Stone (now Paleolithic) and New Stone (Neolithic) ages. Mesolithic (Middle Stone) Age, and Chalcolithic (Copper and Stone) Age, were also added to the original structure, and the term “Age” was replaced by “Period.” The full chronology subsequently existed as Paleolithic, Mesolithic, Neolithic, Chalcolithic, Bronze, and Iron Periods. The system has been used to the describe the technological (tool-using) development of peoples in Europe, the Middle East, and North Africa. Outside of those areas, scientists have found development at different rates. Some cultures skipped some of the stages of development altogether. Amazonian tribes, for example, still remain in the Neolithic period, while African peoples south of Sahara skipped the Bronze Age and went straight from using stone to iron. 1831. Thomsen, Christian Jürgensen. Fortegnelse over Georg Friderich Timms undmærkede mynt- og medaille-samling. Kjöbenhavn: Schultz. 1836. Thomsen, Christian Jürgensen. Ledetraad til nordisk oldkyndighed. Kjöbenhavn: S.L. Møllers bogtr. 1855. Thomsen, Christian Jürgensen. Om guldbracteaterne og bracteaternes tidligste brug som mynt. 1857. Thomsen, Christian Jürgensen. Atlas de l'arehéologie du Nord représentant des échantillons de l'age de bronze et de l'age de fer. Copenhague. : De l'imprimerie de Thiele. 1873. Thomsen, Christian Jürgensen. Catalogue de la collection de monnaies. Seconde partie: Les monnaies du moyen-age. Copenhague. : Impr. de Thiele. Olsen, Olaf. 1988. 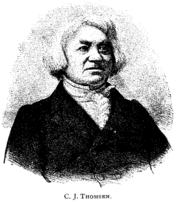 Christian Jürgensen Thomsen, 1788 - 29. december - 1988 / Det kongelige nordiske oldskriftselskab. Aarbøger for nordisk oldkyndighed og historie, 1988. København: Det kongelige nordiske oldskriftselskab. History of "Christian Jürgensen Thomsen"
This page was last modified on 18 February 2017, at 20:59.